Indonesia, Peninsular Malaysia, Borneo and Thailand. Also see our SE Asia Primates and SE Asia Birds pages. Where to see the big animals of Southeast Asia: While Indonesia still claims to have tigers and elephants, these animals are very rare and not likely to be seen outside a zoo or perhaps a "showcase" park in Sumatra. Borneo (both Indonesian Kalimantan and the Malay states of Sabah and Sarawak) is home to the orangutan and proboscis monkeys. Orangutans can also be seen at a reserve in Sumatra. Most reserves welcome visitors and are relatively easy to access. The Komodo Dragon is perhaps the most famous large animal of Indonesia. Since it lives only on Komodo and Rinca Islands in the Komodo National Park, the Komodo Dragon is also easily seen (if a bit difficult to get to). Elephants, both wild and trained can be seen in Peninsular Malaysia at Taman Negara National Park and Kuala Gandah Elephant Reserve. In Thailand, rehabilitated tigers can be visited at the Tiger Temple in Kanchanburi and there are many opportunities to get up close and personal with an Asian Elephant around Chiang Mai, in northern Thailand (and even on Phuket). With the exception of the Komodo Dragon, most of Southeast Asia's larger animals are endangered. Educational opportunities can be found throughout the area at the many preserves. Perhaps you can help in some way. Tigers are one of the most endangered of all the Asian animals, and we were lucky to visit the Thai Tiger Temple (as it's known in English) in the Kanchanaburi Province of Thailand. Here, the Buddhist monks have been taking in orphaned tiger cubs for several years, and are now successfully breeding them. They are fed on cooked chicken (about 5 kg per day) to reduce their blood-thirst as they are visited by hundreds of people each week. At the temple, no one has been harmed by a tiger even though you can have your picture taken while hugging or sitting by them. It is estimated that about 2,000 Indochinese Tigers Panthera tigris corbetti live in the mountains and hills to the north of the Temple and across the border in Burma. Unfortunately, poaching is rife. 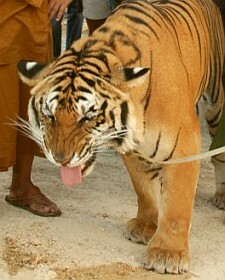 The tigers at the temple will be released into a protected area. About 2,000 Asian Elephants Elephus maximus still roam freely in parts of the Malaysian Peninsula and Borneo and another 2,000 or so in remote areas of Thailand. Sadly, their numbers are decreasing as their habitat is destroyed by the pressures of expanding human settlements and cultivation of fields and, primarily in Malaysia, palm oil plantations. On the Malaysian Peninsula wild elephants still raid farm crops, causing havoc with the villagers. In the past these elephants were shot, but now for the most part they are being captured (with the aid of trained elephants) by the staff of Kuala Gandah Elephant Sanctuary. This small sanctuary east of Malaysia's capital of Kuala Lumpur brings in orphaned or renegade wild elephants for a few weeks or months (sometimes years, for the youngest ones) of rehabilitation before releasing them into Malaysia's huge Taman Negara National Park. 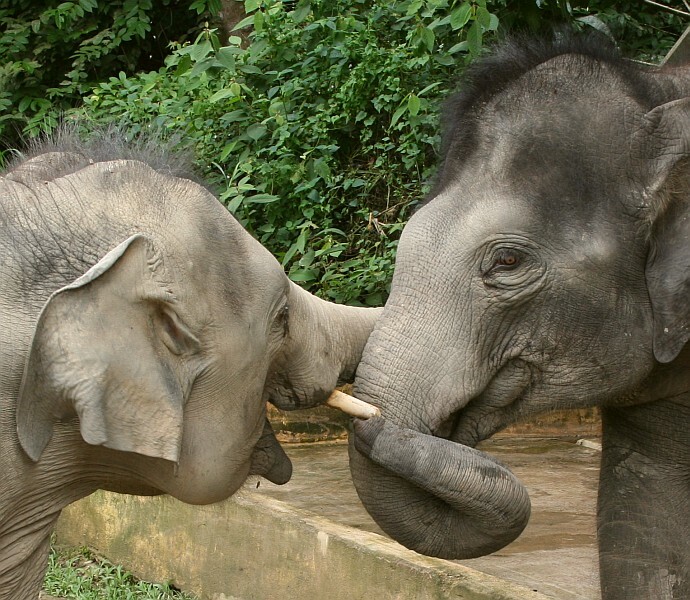 The best place to see elephants up close and personal in Malaysia is Kuala Gandah Elephant Sanctuary. See their MyElephants.org website. In Thailand, the Asian Elephant is a revered animal and the relationship between people and elephants extends back through ancient history. Elephants have a working life of almost 50 years, so often a father/son team of mahouts (care-givers and trainers) worked with one elephant. Forestry has now been banned in Thailand as a result of over-harvesting, so today there are many unemployed elephants and mahouts. In remote parts of the country elephants are still used as jungle transportation, their huge padded feet moving easily through the underbrush and along rivers. Many mahouts and elephants now work in the tourist trade, allowing visitors to learn more about these wonderful huge animals. 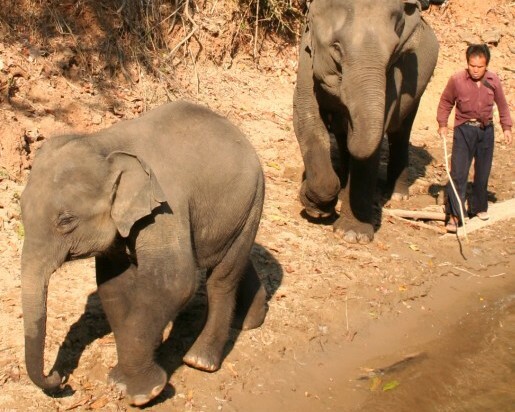 In northern Thailand whole villages are dedicated to caring for and working with large families of elephants. Elephant treks and visits to working elephants camps in northern Thailand can be arranged through tour agents in Chiang Mai, Thailand. Asian Elephants are shorter than African elephants (males being about 1m or 3' shorter). They have more toes (5 on the front feet and 4 on the back), and only 1 fleshy lobe on the end of the trunk. (African elephants have 2 lobes on their trunks). Asian elephant ears are smaller, not covering their shoulders like those of the African elephants. The Asian elephant's back humps up, while the African elephant's back is bowed. African elephants are not generally trainable. 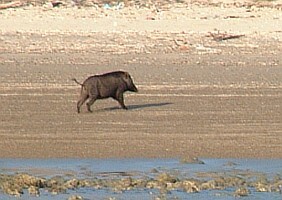 Wild Pigs are found throughout SE Asia. We saw them in two distinct habitats in Indonesia: on the arid beaches of Komodo and Rinca Islands in southern Indonesia (left) and again deep in the rainforest of Kalimantan (right). Like their cousins, the warthogs of Africa, wild pigs raise their tails when fleeing danger. (Recognize the term "High‑Tailing it?") They are omnivorous, feeding on whatever is available, and are responsible for much destruction to cultivated fields. In Tanjung Puting Reserve in Kalimantan (home to the orangutans) the Borneo Bearded Pigs Sus barbatus (right) often compete for the food put out for the rehabilitated orangutans. 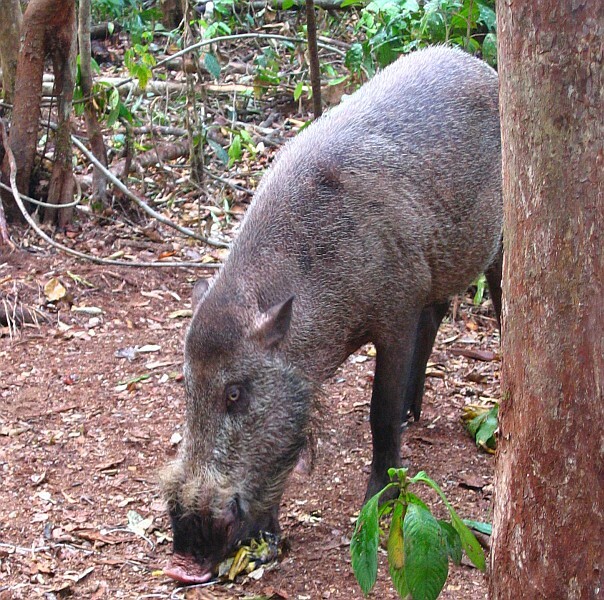 Wild pigs have long canine teeth that grow upwards and outwards, forming formidable small tusks. 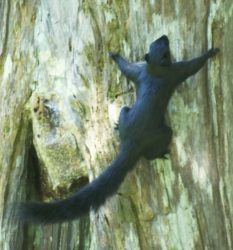 Malayan Black Giant Squirrel on Penang Is. 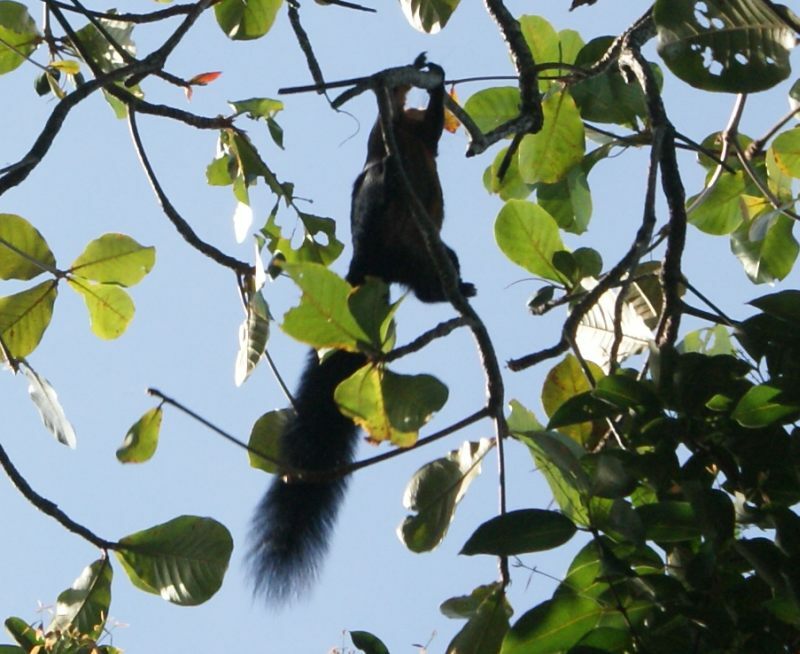 High in the trees over a spice garden in Penang, Malaysia we spotted a VERY big squirrel. It turns out to have been the Malayan Black Giant Squirrel Ratufa bicolor (left). 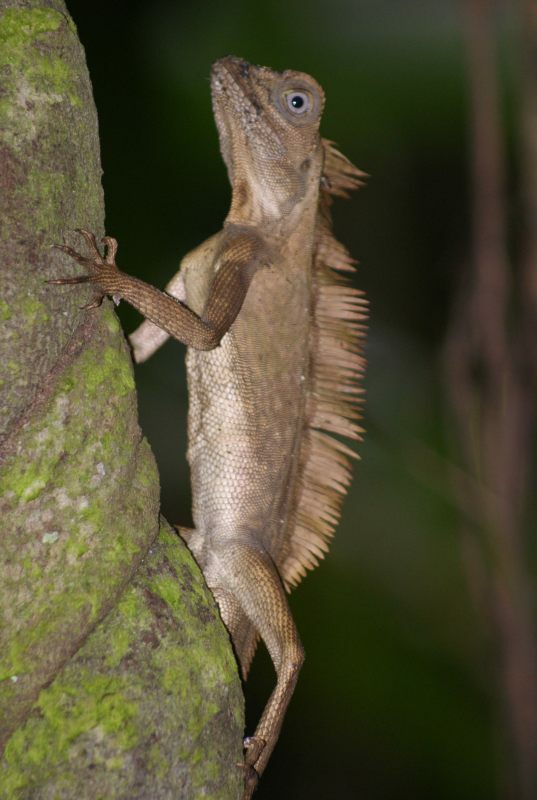 Growing up to 0.9 meters (38 inches) in length, these animals are primarily arboreal (living in trees) and feed on seeds, nuts, and occasionally insects. 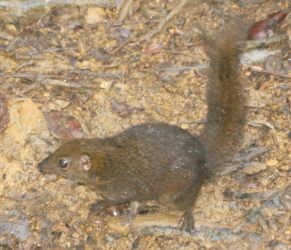 They are found primarily in the canopy of primary forest so it was surprising to see one in Penang's northern forest. They are usually solitary, and can leap great distances with excellent agility from branch to branch. 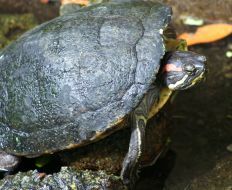 They range throughout most of Southeast Asia, but their habitat is declining, and they are no longer found in Singapore. Given the angle of the photo, we were not able to see the pale buffy/orange coloration of the cheeks, upper chest, or top of the forearms. 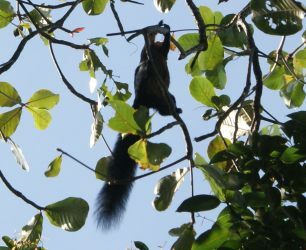 Malaysia's Black-Banded Squirrel Callosciurus nigrovittatus (right) is more akin to the animals we know in North America, as their size (up to 50 cm or 19 inches) seems more familiar. These small rodents have white and black bands on their sides and belly. They're found in both secondary and primary lowland forest, but seem unable to adopt to the re-growth of heavily logged areas. They are absent from Singapore. They feed on fruits and seeds. The one here (right) was photographed at Bako National Park, at sea level, in Borneo's state of Sarawak. Prevost's Squirrel Callosciurus prevostii has many subspecies, each with a varying color pattern. We first met the Prevost's squirrel in the primary forest of Sepilok Orangutan Sanctuary, Sabah, Borneo. This subspecies (left) appears all black with a cream-colored belly and chin just beginning to show. Other subspecies have more striking colors, such as white or orange side stripes and belly. These rodents are diurnal and almost exclusively arboreal. They prefer sweet fruits to nuts or seeds, and also feed on termites and other insects dug from rotting wood. Although they are found primarily in lowland rainforest, they will venture into agricultural areas, even palm oil plantations, in search of food. 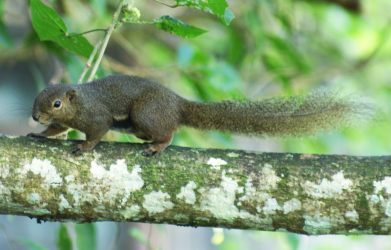 They have blunt snouts and are the largest of this genus Callosciurus, reaching up to 54 cm (21 inches) in length, including the bushy tail. 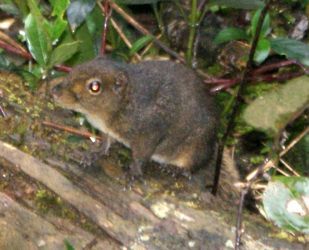 The lively little Mountain Treeshrew Tupaia montana (left) was one of the first creatures to welcome us to the rest stop on the Mesilau trail on Mt. Kinabalu. Bold and inquisitive, it reminded us of the chipmunks so common in the western USA. Except that it has a very sharp nose! These small rodents appear all gray in the field, but in better light you can see a pale shoulder stripe. They occur on Mt Kinabalu from 900m to 3170m (2970' to 10,450') and in other mountains of Borneo. They are endemic to Borneo. Dremomys everetti is the Latin name for the Bornean Mountain Ground Squirrel. 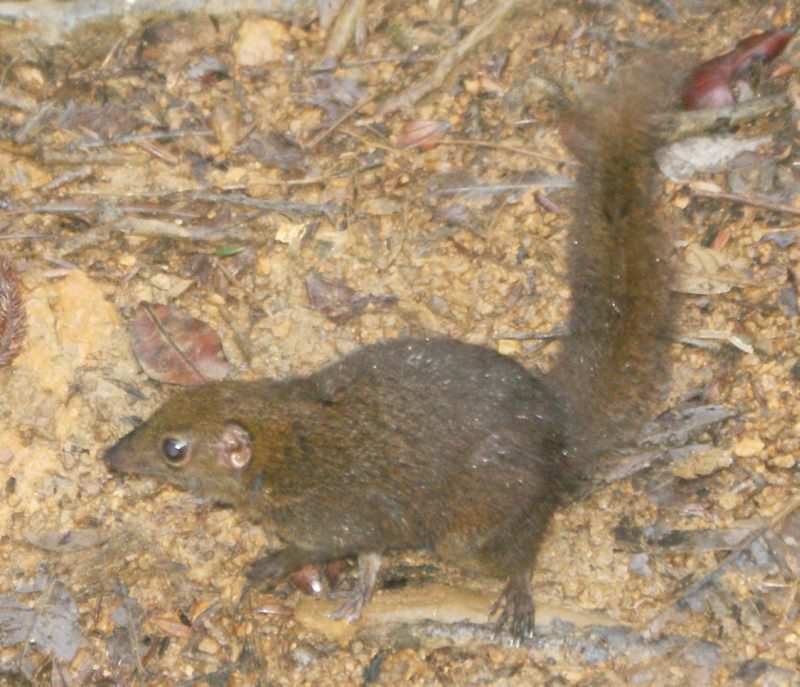 This small rodent (right) is one of the most commonly seen mammals on the slopes of Mt Kinabalu at elevations between 1000‑3400m (3,500‑11,200 ft). While Jon and I rested in a small wooden shelter on the Mesilau Trail on Mt. Kinabalu, this little guy peaked out, wiggled his snout, and skittered away again into the underbrush. These small squirrels have grey/buff backs and bushy tails, with a creamy belly. They are endemic (occurring nowhere else) to Borneo. In southern Indonesia there is a whole national park named after the world's largest lizard: the Komodo Dragon Varanus komodoensis. A member of the family of monitor lizards, the Komodo is a fearsome creature, reaching a length of up to 3 meters (10 feet). 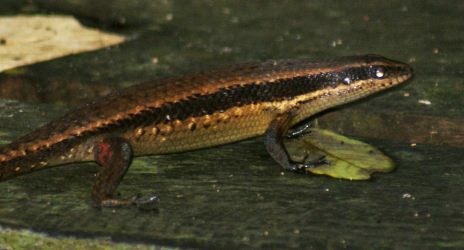 These lizards have fork-like tongues and are able to swallow their prey whole. 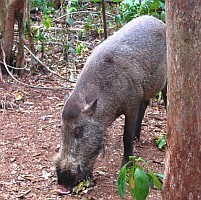 They eat all manner of small animals (and some not so small) including insects, birds, mammals, plus carrion. 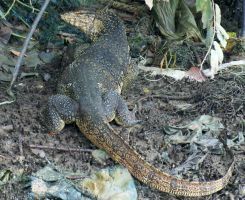 Found only on Komodo and Rinca Islands in southern Indonesia, these large carnivorous lizards have been able to flourish for they are not hunted by the local people. Komodo dragons are shy and elusive except when they gather near the national park headquarters for feeding. Walking the trails of Rinca Park and Komodo we only occasionally spotted juveniles in the dry brush. Larger animals have been known to attack humans, pigs, and goats. 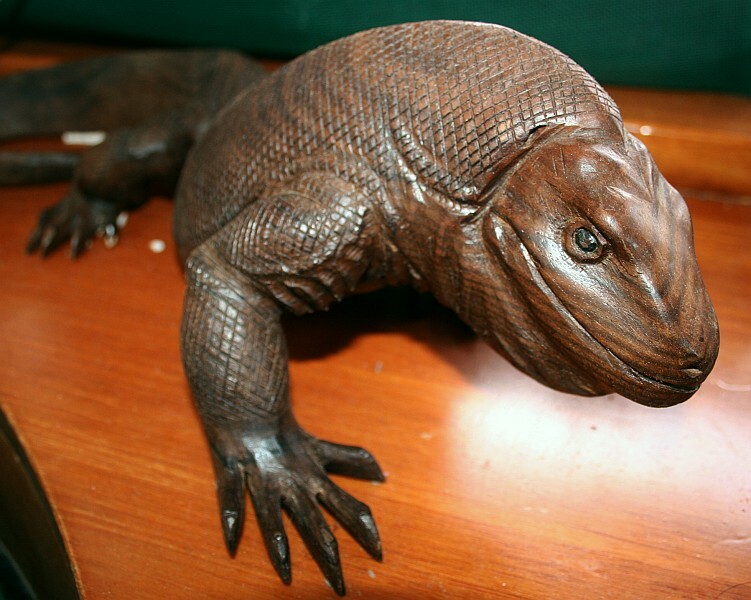 The wooden carving was done by tribesmen on Komodo Island, Indonesia and now resides in Ocelot's salon. 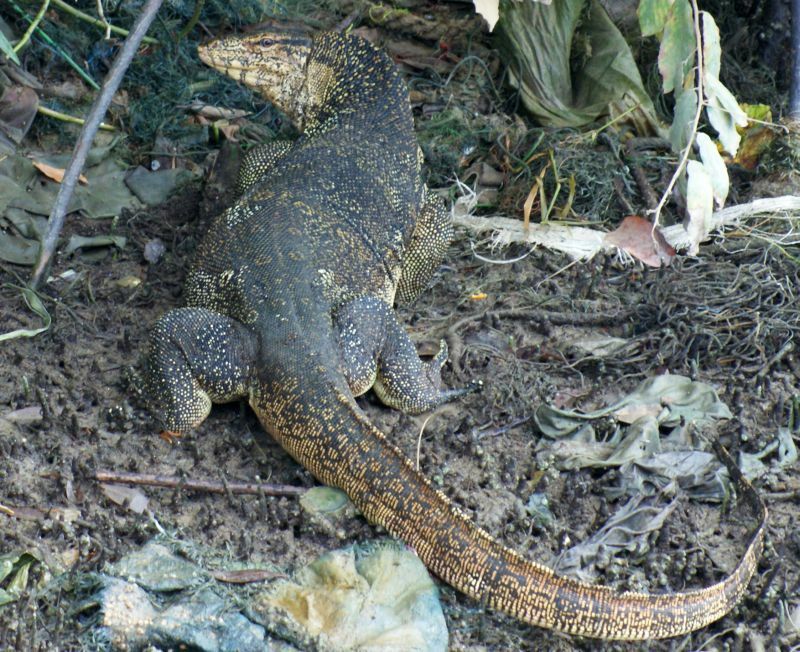 Closely related to the Komodo Dragons are the far more common, and far less aggressive Water Monitor Lizards Varanus salvator. These water-loving lizards are found throughout SE Asia, and we frequently saw them in and near rivers, streams, and even along the shores of the ocean or out on islands. Some swim in the anchorages, and climb up onto the docks of the marinas. They feed on fish and small amphibians and invertebrates. On the island of Penang, off the west coast of Malaysia we came upon two huge monitors (right) on the bank of a small stream -- they were each about 6 feet (1.8m) long! Water Monitors eat anything they can swallow: including snakes almost as big as they are, small deer, and even carrion and dead bodies. (Yum.) When threatened they hiss, puff up their cheeks and lash out with their tails. They climb well, and the young may stay in trees for many hours to avoid predators. They are not listed as endangered, but they are hunted for food by indigenous people throughout South East Asia. 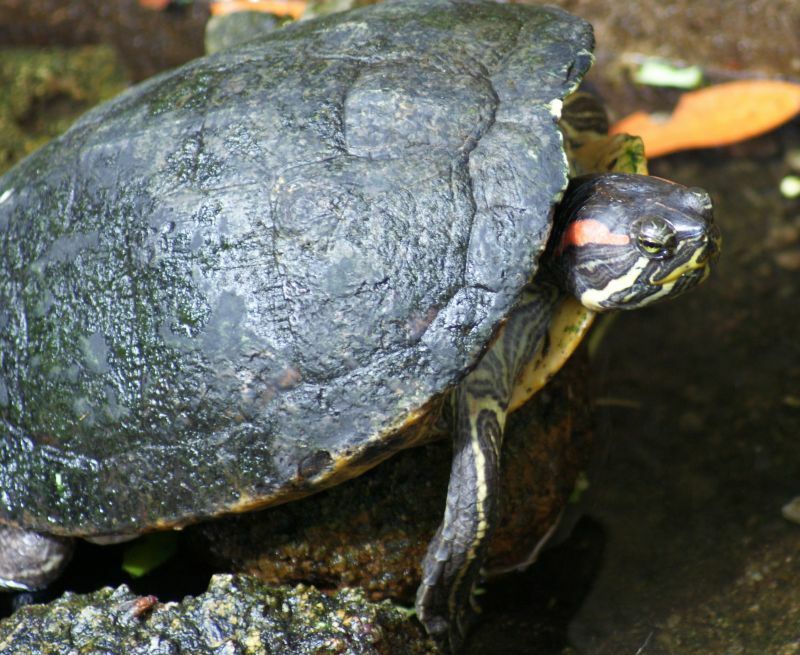 This colorful Malayan Box Turtle Cuora amboinensis is supposedly common in Malaysia, but we only ever saw them in captivity in ponds, such as those near Chinese temples or bird parks. It has a striking red line on the face, with yellow lines radiating from the eyes and mouth. They are often taken for the pet trade. Wagler's Pit Viper Tropidolaemus wagleri is one of Malaysia's most common poisonous snakes. The "pit" part of the name refers to the two cavities behind the nostrils that have heat sensing organs to allow the snake to sense the warmth from prey at night, which is when it is active. Pit vipers are viviparous, meaning they give birth to live young (the eggs are broken open inside the female). 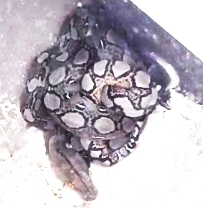 A female can give birth to up to 50 baby snakes, which can care for themselves immediately upon birth, and come with fully loaded poison sacs, ready to fill their hollow fangs with venom. The venom from a pit viper attacks the red blood cells of its prey (as opposed to other venomous snakes whose poison effects the nervous system). Wagler's eat small rodents, birds and sometimes frogs. The animal at left was in the rainforest of Sarawak, Borneo, right beside a trail. It seems to have been injured on the head. Wagler's Pit Vipers go through several color phases, this being the third (Sulawesi) phase, with green background and blue bars, with a blue bar from the nostril along the head. The young are green with red and yellow dots. Pit vipers are characterized by their triangular heads. Their fangs lay flat in the mouth, and spring forward when they bite. Although SE Asia is home to many snakes it is very rare to see one. In fact, we saw only 5 wild snakes in 24 months of travel in Southeast Asia! On the shores of Chalong Bay, southern Phuket Island we were astonished by the rapid movement of a slim green, black and yellow snake. It slithered out from under leaf litter, right between shoes feet(! ), and across a sandy patch, where it posed long enough to be photographed! 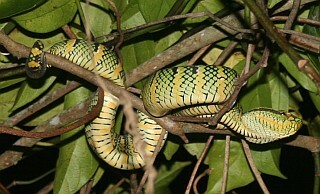 Although the colors are reminiscent of the juvenile Wagler's Pit viper (above) it did not have the characteristic triangular head. With the help of the photograph we were able to identify it as a Golden Tree Snake Chrysopelea ornata ornatissima. Our Thai contractor, Golf told us that the name in Thai means "Golden throat". This snake is very fast, and is active in the daytime. It eats rodents, geckos, and small lizards. Although it is a member of the viper family, its poison is mild enough to not severely affect humans. We were lucky to not corner it, though, for it is known to bite very quickly if it can't escape. They grow to about 48" (1.4 meters). The one we saw was about 30" or 80 cm. We were anchored off Malaysia's "Jungle Island" of Langkawi (north-west Malaysian Peninsula) after a few days of heavy rain when we realized we had a snake on board Ocelot! We didn't know what it was, but we knew we didn't want it inside, so brave Sue pushed braver Jon outside the main doorway (right by the snake!) and slammed the door shut! With the boat hook (a long pole with a dull hook) Jon was able to lift and flick the snake towards the water. Unfortunately, it landed in our raised dinghy, not in the water. Brave Sue then went outside with the camera and captured a bit of digital footage of the event. Later, when the hearts rates had lowered, we could ID the snake as a Reticulated Python Python reticulatus. Not only is the pattern characteristic, but the dark stripe down the head and the elongated shape of the head are clues to its identity. These snakes can reach huge sizes: up to 30' (9 meters) and weigh over 320 lbs (145 kg). They are very active in the evening and at night, searching for prey they can squeeze, suffocate, and swallow whole. They prey on chickens, pigs, dogs, rodents, whatever they can get. They are very good swimmers. Large pythons are very aggressive and are dangerous to humans. The little 5' (1.5 meter) guy in our dinghy may not have been a danger to us, but unfortunately he was probably one very angry snake at having been poked at and flipped 3 times before he returned to his familiar ocean! It is possible that he crawled into our dinghy while it was tied ashore the previous evening, or, more likely, he swam or traveled on a floating mini-island of sticks which bumped the boat, and it decided to dry out a bit by slithering up our sugar-scoops from the sea. In the secondary forest alone the banks of the Kinabatangan River in northern Sabah, Borneo, we came upon this striking Black Banded Skink Mabuya rudis (left). This lizard is primarily terrestrial, and probably diurnal. It eats flies, moths, grasshoppers and cockroaches (yum), and lays clutches of 2‑4 eggs. It is found in low and midland forests up to 1300m (4300') throughout Borneo, Sulawesi, Sumatra and the Philippines. On the right, this handsome crested lizard (possibly Agamidae family) was climbing a tree in the forests on the slopes of Mt. Kinabalu, Borneo. We have no other ID on him/her. Can anyone help? What a beauty! 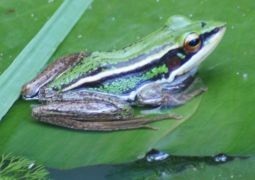 This small green and black frog, Hylarana erythraea (left) was basking on the water lilies in the Spice Garden, on Penang Island. It is apparently common around human habitation, including irrigation ditches and agricultural areas. I found an ID for it on a website about Borneo frogs. This warty brown toad (right) was hugging a concrete wall on the highest hill on Langkawi Island, Malaysia. We don't have an ID for him/her. But what a bod! 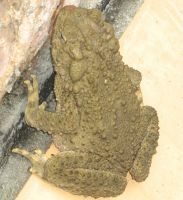 Something only another toad could love!